Aweh Africa Backpackers - Durban North Accommodation. 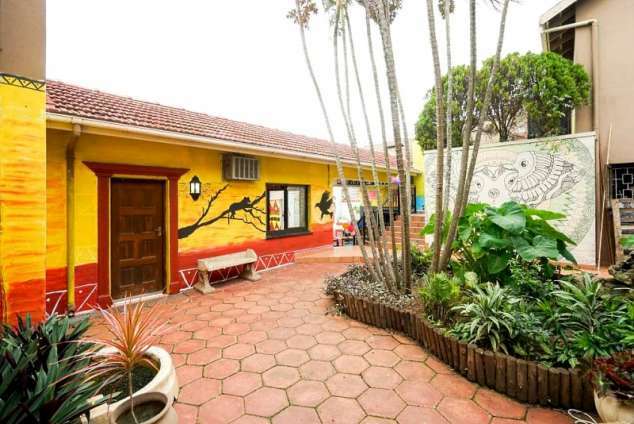 We are a small cozy backpackers in Durban North – more like a hippy community to welcome guests from all around the world. We are about socializing, and finding the best possible experiences for our guests. You want to explore the city, cruise around in a beach buggy, laugh over dinner, and share some great conversations and travel stories? You are right on track here. We run this place like our home. With lots of love and always with an open mind. Come, laugh and relax with us! Nature as beautiful as nowhere else. Durban is the perfect point to be for planning tours to Lesotho, the Drakensberg or the Valley of Thousand Hills. The Dam with Waterfalls present perfect hide aways from the city life. Certainly a stunning corner of this world. A surfing paradise … for beginners as well as for professionals! As in many places along the coastline in South Africa, the beaches are stunning and the waves simply great for surfing. You can choose between many surfing spots, and diving areas, to swim with sharks, dolphins or simply enjoy the beautiful underwater world through diving trips. And btw: No shark attacks for over 20 years!! Stunning hidden nature places. The Dam is not only great for going for a swim. At the right spots you can come across some wildlife too. If come along with us on a buggy ride through the towns and remote areas around the Dam, you can be sure of getting a proper South Africa experience with locals, wildlife and african vibes. The Mzinyath Falls are just a 30 minutes drive away from town, and they are surely one of the hidden spots in africa. You are tired of touristy places? Take a half day trip up to the waterfalls, chat to the locals on the way, and go on an easy hike down the Mzinyathi Gorge. Not far from the Mzinyathi Falls, you can discover more Zulu culture, by hiking to the other end of the Mzinyathi Gorge. For hundred of years people have been living in these caves, which can also be seen by the cave paintings. Has anyone really bothered to count them?…Probably not, but they are incredibly stunning from some carefully chosen view points. Take half a day to cruise around through hills and nature. Even better in the beach buggy to enjoy the wind in your hair. The Drakensberg is a stunning strip in this world. Wherever you turn, it is beauty and astounding sights. It is about 3 hours from Durban to get to the most popular hiking trails, and Zulu caves. Perfect for a 1 or 2 day trip into the wild. Fun fact: Table Mountain is not the highest mountain in South Africa, as claimed by lots of tourist attraction in Cape Town. Drakensberg (3.482m) is almost three times as high then the popular Table Mountain (1.085m). The Oribi Gorge Nature Reserve is a wonderfully scenic area offering excellent hiking opportunities. The area boasts cliffs and forests and spectacular hiking trails as well as picnic sites. And if you feel brave enough, you can try the Bunjee-swing for the extra adrenalin-kick. Cathy is not only our amazingly heart warming manager at the backpackers, she also runs her own transportation business, with her beach buggy Buttercup. For everyone who thinks taxis are just lame (and not always the safest choice), Cat’s buggy rides will be the way to go. Travel through Durban in style! Book a tour and let your hair loose in the open air Buggy. We do have three lovable dogs at our place, named Marley, Noodle and Milo. In case you are afraid of dogs, or you are allergic to them, please take this into account before making a booking. 367 page views since 05 Oct, 2018.